On October 17, 1915, Arthur Miller, perhaps America’s foremost playwright, was born in New York City to Isidore and Augusta Miller. 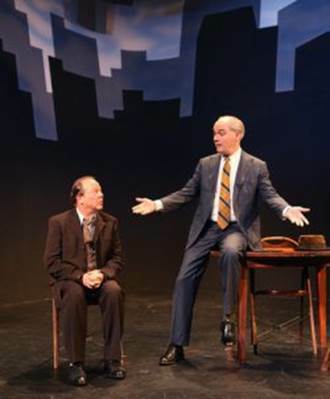 One hundred years later, his greatest play, Death of a Salesman, a soaring American tragedy, is being presented in Yiddish. It is as if it were beshiert. That’s Yiddish for “meant to be”. The flow of story and the flow of language are so interwoven it is as if Miller had written the play in Yiddish, then translated its words and soul into an American tragedy, its lines now parsed in schools and colleges, its sad music as alive as never before. Well known actor Joseph Buloff and his wife Luba Kadison, star of the Yiddish theater, were so enraptured by Death of a Salesman when they first saw it at its opening in New York in 1949 they translated the play into Yiddish and took their Yiddish production to Argentina. Yiddish is spoken world wide, wherever there are Jews – and even where there are not. The play was so successful it ran for two years, was translated into Spanish from the Yiddish and ran for more years. Buloff, who later made his successful transition to English speaking stages observed that most of Broadway’s audiences for Death of a Salesman who believed they were watching an American tragedy, realized they were watching themselves when they saw Buloff’s Yiddish production in Brooklyn. People talk familiarly about Willy Loman,, the play’s central character, as if they knew him in their own lives. Willy is one of the great roles in the theater, his interpreters remembered for being completely, authentically Willy, all of them different. Add Avi Hoffman, the current interpreter in Yiddish, as a distinguished member of that august company, in some ways the most compelling. Because he’s acting in Yiddish? Very Likely. You don’t just speak Yiddish in words, you perform it with your whole body. And this talented company performing this now classic play, have been lovingly directed by gifted Moshe Assur into being acidly vivid in a new interpretation which focuses on the feverish imaginings of Willy as he breaks down in mind, in spirit, in body. Salesman Willy Loman, 63, has been traveling for 36 years through the hardscrabble decades of the early twentieth century selling from his sample cases, always hale fellow, always glad hand, always a big smile in spite of the daily defeats and the turmoil inside him. His sons, his vaunted sons no longer idolize him, his precious house, shabby and overshadowed, still not paid for, everyone else he knows successful far beyond his reach. Daily, in his mind, he has conversations with his rich brother Ben, long gone, who walked into the jungles of Africa and came out with diamonds, strode into Alaska and came out covered in gold. Willy drives himself and drives himself and cannot make ends meet. If it hadn’t been for Linda, his loving wife, Linda, how could they go on? How could he go on? Linda, always saving, Linda, always encouraging, Linda always loving. Director Yassur throws his whole focus on Willy. He has taken the Buloff translation and staged it so that Willy has conversations not only with Ben, day and night, but with his boys when they were young, when they were wonderful. Director Yassur has Willy’s sons, older, sadder, watch him as he has hallucinatory encounters with the golden images of his boys. Biff, the great athlete the wonder boy everybody loved. Why did he stop?. Will knows and never admits he knows. Biff has thrown his life away and the guilt eats Willy. And Happy, his hot shot younger son? The lady killer? The smoothie? The shallow, empty poser? Why is he like that? Willy knows and won’t admit his own responsibility. It’s Linda who carries him. And Willy knows that as well and will not admit it. He’s going to get back on top. Linda believes him, has to believe him. And when he’s fired, no future, no income, no boys, he breaks. There’s no question that setting the play in Yiddish makes it more searing. Yiddish, the language of body and soul as well as words, flays open the red drama inside to a depth its English characterization has never quite achieved. Avi Hoffman as Willy is wrenching. Linda, performed by Suzanne Toren, wounds with her sweetness, Lev Herskovitz as callow Happy is biting, Daniel Kahn as Biff is achingly real, the best Biff ever. The splendid, cool kindness of Shane Baker as Charley becomes an anomaly of Gentile rectitude in Jewish charity. I also liked Ben Rosenblatt, Itzy Firestone, Aaron Shapiro, Ilan Kwittken. Marc Marcante’s bone simple setting works just fine, as do the English titles. For the first time, the music, composed and performed by Michael Winograd, makes sense with the play. 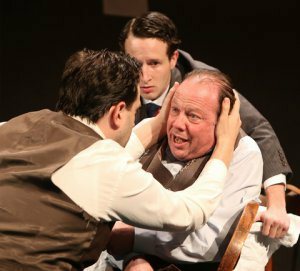 Death of a Salesman in this Yiddish production is a worthy addition to the present New York theater scene. It honors Arthur Miller and his great play. Death of a Salesman at the Castillo Theatre, 543 West 42nd Street. (In Yiddish). Tickets: $50. Students $20. 866-811-4111. 2 hrs. Thru Nov 22.